Juca Jahier - a long-standing ally to consumer co-operatives - was elected EESC 32nd President. At its plenary on 18 April 2018, the European Economic and Social Committee (EESC) elected Luca Jahier as its new President. He is the Committee’s 32nd President and will head the institution for the next two and a half years. The new president’s four priorities are: sustainable development, promotion of peace, strengthening the role of culture and giving a voice to Europe’s young people. Consumer co-operatives welcome all four areas, but take particular interest in the ones concerning sustainable development and youth due to their distinguished track record as leaders in these domains through their activities on national level. Through their continued activities on national level, consumer co-operatives will remain at the forefront of driving sustainable development and defend societal interests, which will directly contribute to the objectives of the Jahier Programme. In his inaugural speech, President Jahier shared his vision: “I invite all of you to join me in a strong civic engagement for our sustainable European future. I invite you to dream with me of a re-energised Europe and to work together for a second European Renaissance! Europe – still plagued by high levels of poverty and the unresolved migration crisis, as well as by the low levels of trust in democratic institutions – would benefit from a powerful humanistic revolution and a transformation similar to that of the Renaissance”. The president's programme is aimed at achieving this “rEUnaissance” by giving the greatest emphasis on sustainable development, which should underpin all transformations that will shape the Europe of tomorrow, such as the fourth industrial revolution, a circular and low-carbon economy, growing challenges to EU values, threats to peace and stability on the EU's borders and many others. Bottom-up initiatives involving local and regional governments, citizens and civil society will have a key role to play in this agenda for achieving economic prosperity, which must go hand in hand with environmental sustainability and social inclusion. President Jahier said the EESC would take an active part in the upcoming "strategic rendez-vous", such as the EU summit on the future of Europe and participation in President Macron's citizen consultations. The EESC also needs to strengthen its collaboration with other EU institutions and its dialogue with civil society at large in all EU countries. "We have the opportunity to give a new impulse to European civil society engagement. For the Europe of tomorrow, we must have the courage; we must dare to imagine a new world. There is no time to waste, as so many defeats in history can be summarised in two words: too late," Mr Jahier concluded. Consumer co-operatives heartedly welcome the election of Luca Jahier as 32nd President of the European Economic and Social Committee, who is a friend and supporter of the co-operative movement. 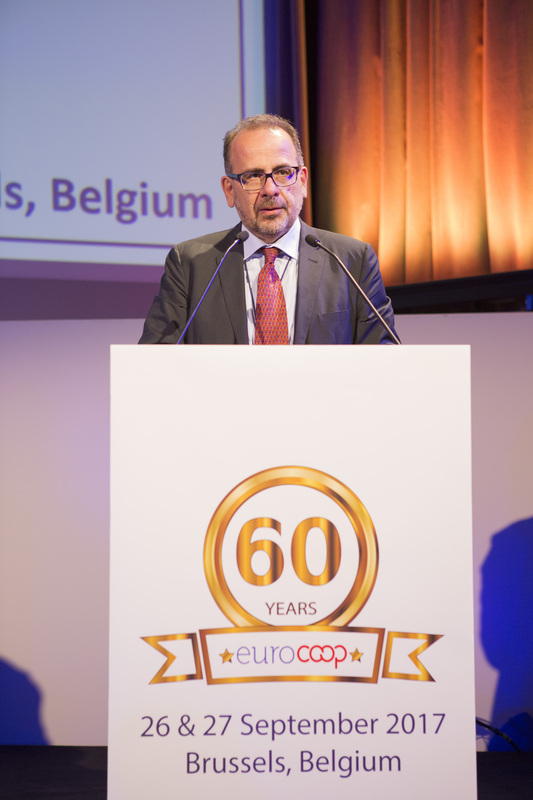 President Jahier was a keynote speaker at Euro Coop’s 60th Anniversary in September 2017. Throughout the years, Euro Coop has established excellent working relations with the EESC. Unlike the EESC Members, who are elected for a five-year term of office, the president is chosen from each of the three groups (Employers' Group, Workers' Group and Various Interests' Group) in rotation, for two-and-a-half-year terms. They are elected by a simple majority during the inaugural assembly session, which on this occasion took place on 18 April. This is called the mid-term renewal. Following his election, the president set out the work programme for his term of office. The president is responsible for the orderly conduct of the Committee’s business, and represents the EESC in its relations with other institutions and bodies. The two vice-presidents – elected from among the members of the two groups to which the president does not belong – are responsible for communication and the budget respectively. The EESC is made up of 350 members from its 28 Member States. Nominated by their national governments, they are appointed by the Council of the European Union for a period of five years. They then work independently in the interests of all EU citizens. These members are not politicians but employers, trade unionists and representatives of various activities, such as farming, consumer and environmental organisations, the social economy, SMEs, the liberal professions and associations representing persons with disabilities, the voluntary sector, gender equality, youth, academia, and other.